If you've ever wondered what the Christian life should look like, James tell it like it is. In this five-session video Bible study, Dr. Lina Abujamra shares with her signature energy what it means to be the real deal, and how to live authentically and victoriously through the challenges of life. Each video session is 40 min long, and you can follow along with the Study Journal which contains the lessons outlines, discussion questions, and space for adding your own notes.You can choose to do this study on your own or better yet with your small group. If you do this study you will grow in your walk with the Lord. You will get stronger in your fight against temptation. You will better understand what it means to be a true follower of Jesus. You will be challenged to leave the status quo and become more like Christ. You will have zero regrets. I promise you that. You're about to embark on a life-changing journey. I'm not just saying that to pump you up. I really mean it. In the next ten episodes of the Resolved video series, you're going to be challenged to make some radical decisions about your life and future. You're going to be reminded of who God is and what He has done for you and it's going to blow your mind! 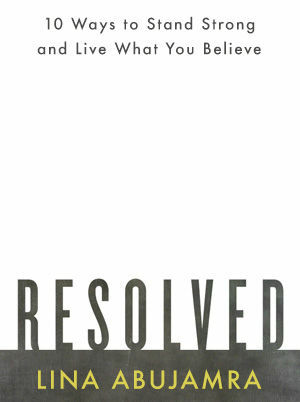 If you've read my book Resolved: 10 Ways to Stand Strong and Live What You Believe, you already know what I'm talking about. If you haven't read the book, you will want to read it after watching the Resolved video series. Every day and in every possible way, God is in the process of drawing us closer to himself. Sometimes we listen better than others. The fact that you've taken time out to watch this video series shows that you've already resolved to jump in the deep end with God. You've already resolved to take the first step towards change. Well done. Now sit back and relax, or rather lean forward, and hang on. This study is not for the faint in heart. If you like speed, you'll love my style. And if you're serious about changing your world for Christ, you're already on the road to doing it! One last thing: you can watch the Resolved video series on your own, but it's even better with other people. We've put together a PDF outline of my notes and study questions that will help you process the material. Don't forget to pray: lasting change is only possible with God's help. I can't wait to hear what God does in your life! I'm so glad you said yes! Tired of feeling sorry for yourself? Sick of answering the same old questions about why you still haven't found your perfect match? Despite what many people think, singleness is not a disease. It's not the lesser option. Singleness is God's gift to you today. In Thrive, Lina AbuJamra - who has been single for over 40 years - will show you how you can make a difference with your life right now instead of sitting around waiting for something to happen to you. If you're ready to figure out what God has to say about singleness instead of relying on your own feelings and conclusions, this book is for you. Isn't it time you get excited about your life in Christ and quit falling back into the same old pattern of thinking? Freedom. Joy. Abundance. Hope. All these are yours the moment you embrace all that God has for you right here right now. Go ahead. It's ok to smile. Life as a single Christian is good.